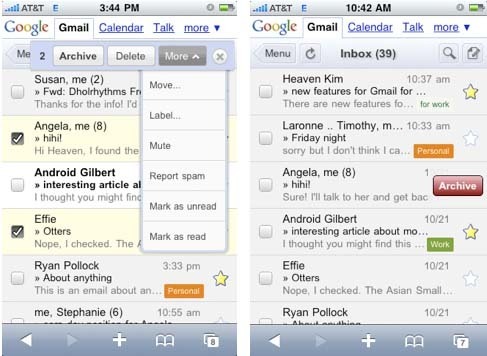 Gmail New Features - Gmail Loads Within Three Seconds On Phones ! 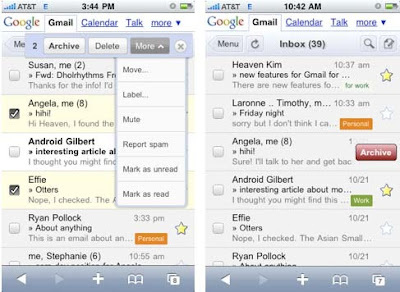 In order to make the new version of Gmail for mobile faster and more usable, Google has redesigned it on last April. Moreover, over the last six months, Gmail has added a lot of improvements like Mute, Label Management, keyboard shortcuts, smart links, an outbox, and the ability to move messages (label and archive in one step). But a few newer features like swipe-to-archive and auto-expanding compose boxes, take advantage of these mobile phones' unique properties. At the same time, Google also made address auto complete faster, enhanced refresh capabilities and sped up loading of Gmail for mobile in three seconds on newer smartphone. As long as you have iPhone, iPod touch OS 2.2.1, you don’t need to download or update.